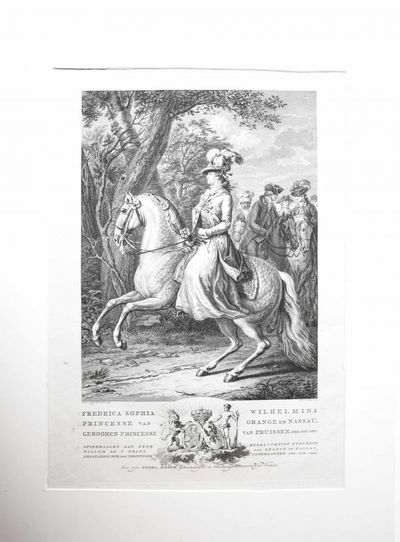 viaLibri ~ Portrait: FREDRICA SOPHIA WILHELMINA PRINCESSE VAN ORANGE EN NASSAU/Prinses Frederica Sophia Wilhelmina van Pruisen. Portrait: FREDRICA SOPHIA WILHELMINA PRINCESSE VAN ORANGE EN NASSAU/Prinses Frederica Sophia Wilhelmina van Pruisen. Stunning portrait of Wilhelmina of Prussia, Princess of Orange (1751-1820). Whole length equestrian figure in profile, turned to the left, with plumed hat, tie, gown, and riding tenure. With a tree to the left and attended by five figures on horseback. With coat of arms and Dutch inscription below. After a portrait (1789) by Tethart Philip Christian Haag in the Rijksmuseum, see SK-A-1225. Signed on the bottom of the representation: 'J.P.C. Haag ad vivum del. / Rein.r Vinkeles sculp. '; inscriptions below: 'FREDRICA SOPHIA WILHELMINA / PRINCESSE VAN ORANGE EN NASSAU...' and address: 'Door zijn DOORL. HOOGH. Gehoorzaamsten en Onderdanigsten Dienaar Rein.r Vinkeles'. Etching and engraving on paper, with broad margins; plate mark: 428 x 298 mm, total: 505 x 377 mm; very nice thick paper, some foxing towards the left, not affecting the representation. In passepartout. Muller 363e.